With her husband dead for some forty years, Queen Victoria, aged 81, passed away in the arms of Kaiser Wilhelm II, Emperor of Germany, aged 42 at the time. This fact will strike you as odd only if you are unaware of Wilhelm -- “Willy”, as she called him -- being Victoria’s eldest grandchild. It wasn't by chance that the Queen of England and Empress of India had such a close family relationship with the German monarch. For one thing, when monarchs view marriage with members of lesser classes as unthinkable, there’s little choice left to them but marriages between ruling families. Prince Albert, Victoria’s consort, was from a German Duchy; Edward VII, their son, married the daughter of the Danish king; his older sister Victoria (“Vicky”) married the German emperor Friedrich (and they were Willy’s parents); and so on. The second, and more important reason, is Victoria’s vision of unifying Europe under a single dynasty, to ensure long-lasting peace. And indeed, King George V of England, Kaiser Wilhelm II of Germany, and Tsar Nicholas II of Russia were all cousins, and all very fond of each other. WWI broke shortly after the murder of Archduke Franz Ferdinand of Austro-Hungaria by the Serb Gavrilo Princip. Ostensibly the reason for Austria’s declaration of war against Serbia (“And so they’ve killed our Ferdinand,” begins The Good Soldier Švejk, one of the first and best anti-war novels), the murder was no more than an excuse, the official casus belli for a conflict long deemed inevitable by most of the parties involved. There are many scholarly volumes about the events leading to the war. 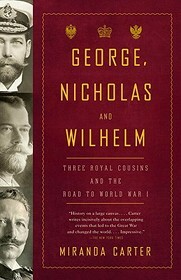 Despite its subtitle, it would be a mistake to consider George, Nicholas and Wilhelm as another of those. No serious discussion of the path to the war can ignore France, Austro-Hungary, and the United States as crudely as this book does, treating them at most as support characters in the great drama of history. Rather, this book views some sixty years of history through a very specific prism, that of the family ties, upbringing, education, choices, and personal lives of the three monarchs. How much could George, a monarch in a parliamentary and constitutional monarchy, affect the war? To what extent could Wilhelm, grossly disobeyed by chancellor Theobald von Bethmann Hollweg (who accompanied the Kaiser’s demand to the Austrians to stop in Belgrade, back when the war was just a conflict between Austria and Serbia, with a note that it wasn't to be taken seriously and was simply for propaganda purposes), prevent the disaster? Would it make sense to blame Nicholas, shielded from reality by members of his court, with Russia’s involvement and disastrous tactics? These are the questions that this book attempts to answer. None of the answers provided, mind you, is really new. Carter’s text is hardly the first to point out Wilhelm’s borderline insanity led to the impossible arms-race between England and Germany, a major contribution to the hostilities. Neither is this the first discussion of the alarming dichotomy between Nicholas, the loving and caring father, the person beloved by all who met him, and the ruthless Tsar who believed that his divine right for autocracy justified massacres of crowds demanding basic rights. The book focuses on their lives and misadventures more than on the politics and machinations that led to that horrible war. Viewed as a combined biography of three people (though devoting surprisingly little discussion to the later lives of those two protagonists that did survive the war), this is a pleasing, informative, and clearly well-researched book. Granted, it’s less of a page-turner than other works discussing royal intrigues, sneaky court officials, questionable family ties, and other aspects of the game of thrones; but then, sadly, this is our own factual history, rather than a work of fantasy. And nearly a century after that war, it is clear that humankind -- even with homo regius mostly removed from the species -- is yet to intern all relevant lessons.